I'll explain what these do but first I we need a bit of a back story. 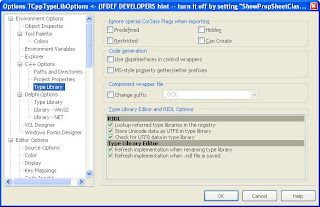 Back when the COM team was working on the new COM features for Tiburon (Delphi 2009 and C++ Builder 2009), we found that ICreateTypeLib, ICreateTypeLib2, ICreateTypeInfo and ICreateTypeInfo2 don't actually support BSTRs even thoough all their string paramters are BSTRs. Somewhere in the writing of the .tlb file the data is narrowed down and the unicode data is lost. After some testing using MIDL 5.01.0164 we found that Microsoft had apparently known about this and worked around it by UTF8 encoding the data and then stuffing it into the BSTR. Then we found that the latest version of MIDL 7.00.0500 produced errors when compiling files with unicode data. So we wanted to support unicode throughout the product so we added support for UTF8 data in type libraries. The two options read UTF8 data and write UTF8 data. This means you can create unicode identifiers (functions and classes) for use between Delphi and C++Builder 2009 (and apparently MIDL 5.01.0164) but that's about it. I would suggest staying away from unicode identifiers in your Type Libraries.